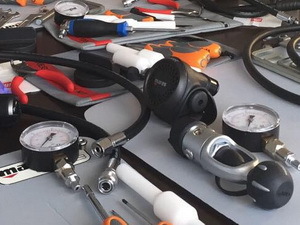 Regular servicing of your scuba diving equipment is very important to ensure safe and reliable performance. Regular maintenance can also ensure your kit has a longer life. Diving regulators should be serviced at regular intervals depending on time and the amount of use they have. Cylinders have test dates and are subject to regulations, if your cylinder is out of date or in poor condition most air fill stations will refuse to fill it. Here at Severntec Dive Centre, we offer service for a wide range of Scuba Diving equipment, from BCD’s and Regulators to tanks and valves. Don’t leave it to chance always follow the service schedules of your equipment. For more information about service call the shop or simply drop your equipment in, let us know if you have something that is urgent and we will do our best to get it back to you in time, or endeavor to provide a piece of loan equipment to keep you diving. In the event that neither option is possible we will offer you a better date to bring your equipment in. Always be aware,sometimes we are held up waiting for specific parts for your equipment and for this reason there can be delays, get equipment serviced early to avoid any disappointment. We are able to service many regulators on site, offering a fast turnaround apply as detailed above. Just bring your regulators into the shop and we will be able to tell you how quickly we can have them back to you. Hydro tests, Visual inspection, Internal shot blast cleaning, O2 cleaning service, External repaint, Valves and & manifolds. Zip replacement, Neck & Wrist seal replacement, Suit pressure testing for Leaks, patching repairs and Boot changes, along with general repairs & modifications. bring your suit in for a price. For most make of dive computer and many watches we are able to change the battery and pressure test the unit. There are some exceptions, but we will be more than happy to return these to manufacturers for the work to be done, giving you peace of mind that the job is done properly and you are covered should anything go wrong.